Hey guys! I hope your Monday is going awesome. My Monday’s been pretty boring, but I can’t complain, I’ll take boring over stinky any day. I can’t complain… about my 8 mile run! 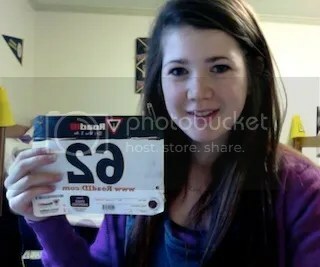 A new PDR (fyi you’ll probably hear that every week until my 10-mile race!) It was tough and I thought about quitting approximately 28374 times, but I sucked it up and finished, even though that mean running back and forth across the park parking lot for the last 0.75 mile because the sun was going down and that was the only area with a street light, and I like not getting kidnapped. Did I mention it was 33 degrees out? I’m not sure where all this commitment came from but I like it. I can’t complain… because I saw a beaver on my run yesterday! I ran past it the first time and it didn’t even register in my head it was a beaver. 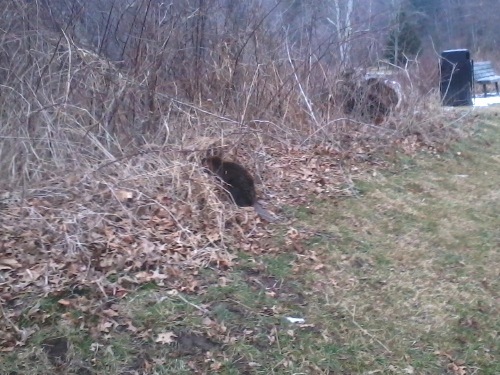 Then I had to run back and get a picture (from a safe distance, beavers are vicious). I think he was drunk because he randomly fell over and then staggered off into the woods. I don’t know how a beaver would get drunk but that’s not the point. I can’t complain… about this nut butter. 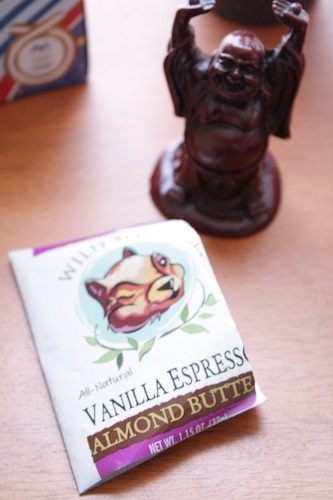 The Earth Fare near me just started carrying Wild Squirrel nut butters and holy cow. Delicious. You need to keep me away from these things. That would be Vanilla Espresso almond butter, can you think of a more perfect food? No. And yes I cut around all three side of the packet to get out every last smidgen of almond butter. Not ashamed. 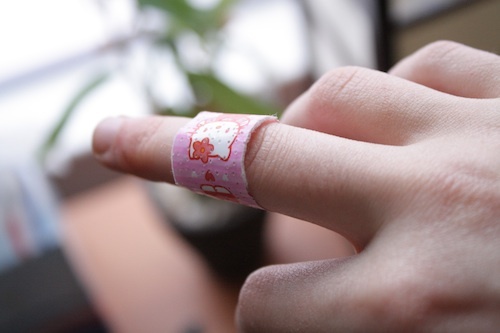 I can’t complain… about Hello Kitty band-aids, they make everything better. Though I will complain that I only have one left. Boo. I can’t complain… about kale chips. Who can? 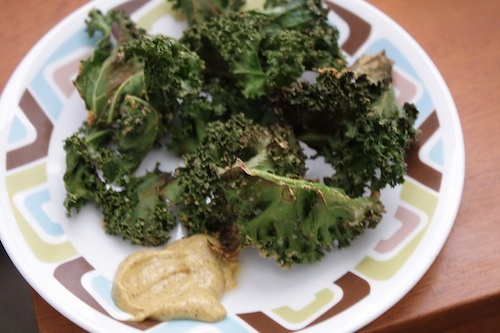 Kale, olive oil, salt, pepper and nutritional yeast. Even my kale-hating roommate ate these. Success! I can’t complain… about running because I’m thinking about signing up for this half-marathon in May. It’s a week before graduation and only 30 minutes away from Boone. I’m just trying not to let the elevation map freak me out. What’s the craziest animal you’ve ever seen on a run? P.S. I made a Facebook page for the blog! I’m not so good at social media (hence my sad number of twitter followers) but it’d be pretty awesome if you liked the page. And I’ll work on figuring out how to use it. What I Ate Wednesday – I’m Not Sorry About It. I can’t believe it’s already Wednesday, where had the week gone? 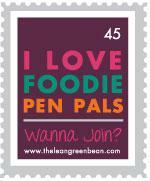 Here’s another What I Ate Wednesday! 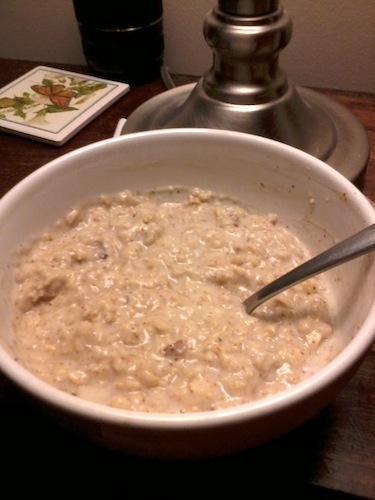 Old fashioned oats, almond butter, soy milk and cinnamon. Same old, same old and I’m not sorry about it. I did sub almond butter for peanut butter after picking some up at Trader Joe’s this weekend. It’s fabulous. I might be a new convert, but probably not since it’s twice the price of peanut butter. The cheapskate in me might win that one. I’m enjoying it while my parents are paying for groceries though. 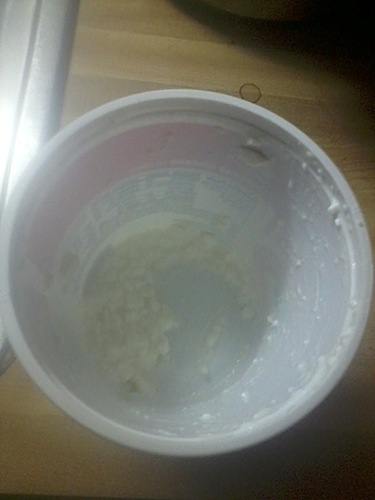 Then I finished up the container of cottage cheese. I buy the largest container at the store and finish it in half a week, mostly straight from the container. Not sorry about it. If I double dip no one will steal any. I love cottage cheese (it’s really good mixed with a scoop of nut butter), and apparently breakfasts that don’t require chewing. I blame it on my inner octogenarian. 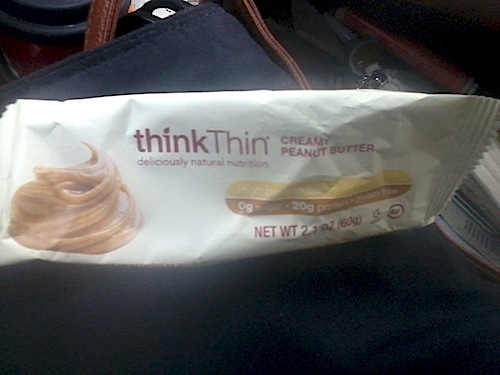 Half of a ThinkThin bar. These are becoming a problem. They don’t even taste that good, there are plenty of bars I like much better, and they’re not even the cheapest bars but I still buy them every week. I’m not sorry about it. Actually I am a little bit. I think I just like these bars because they don’t have sugar, but lots of funky ingredients to make up for it, not such a fan, but they still make their way into my grocery cart. Problem. I was so hungry when I got home. 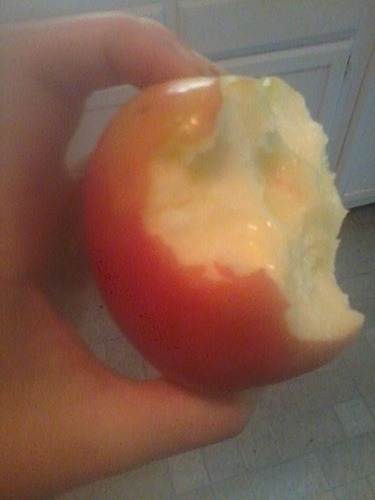 I had to eat something while I cooked lunch so I didn’t gnaw my own arm off. It was tasty. I’m in apple phase at the moment, I don’t understand it but I’m embracing it. 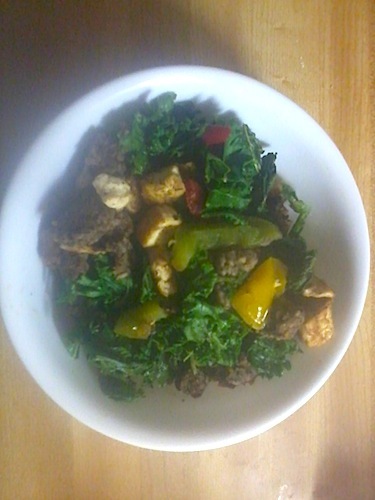 Crumbled homemade black bean burger (I can post the recipe if anyone’s interested), tofu, peppers and kale. It was good, but the crumbled burger patty definitely made the dish. There’s a sad absence of veggies in my fridge/freezer right now, so I’m trying to make do. Bonus about this meal was that I didn’t have to add sriracha because there was some in the burgers. I’m so addicted, and not sorry about it. I even got Haley into sriracha. I’m such an enabler. Multiple spoonfuls of almond butter. I’m trying to make the jar last a week, or it’s going to become one expensive habit. A Joey Jr. (Streaker Style – woo woo) with tofu, black beans, rice, lettuce, cucumbers, pico de gallo, black olives and medium salsa. Good, but not spicy enough, it could have used some sriracha. Seriously. No pictures because I was too busy enjoying some girl time. I was seriously considering grabbing some frozen yogurt at the store next door, but I resisted. My wallet is happy about it, my taste buds were a little disappointed. 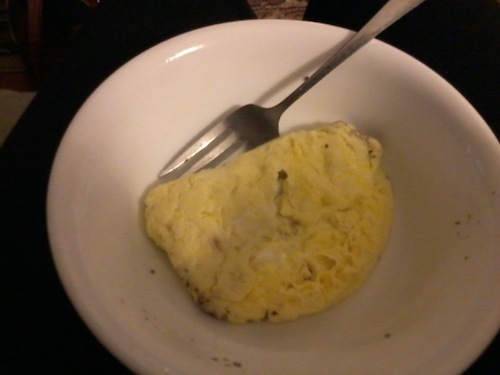 A scrambled egg a la microwave. Microwave because I’m lazy and didn’t want to do dishes. I’m not sorry about it, no shame. It doesn’t look pretty though, but can you really make a microwaved egg patty look photogenic? No. So I didn’t try. Let’s be honest, I wouldn’t have anyway. Followed by a spoonful of almond butter. Or two. So maybe I’m a little addicted.